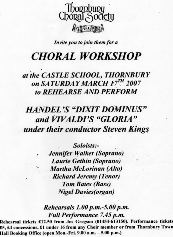 Thornbury Choral Society hold an annual workshop, practising and performing a major choral work in a day, usually in February. 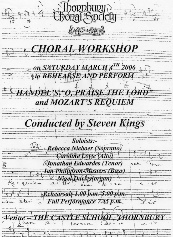 This workshop gives local singers an opportunity to get practice with a large choir under conductor Steven Kings' expert guidance and to introduce potential new members to the workings of the choir. 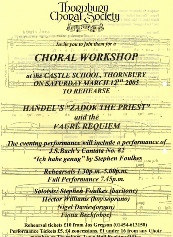 It also raises funds to pay for the performance of works requiring larger forces. In addition, there is usually a retiring collection for a charity. 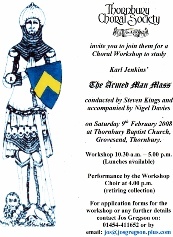 For further information, please contact Tessa Sullivan, our workshop organiser, by email at workshop@thornburychoralsociety.org.uk. 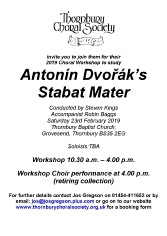 This was Dvorak’s Stabat Mater on 23 February. This was Mendelssohn’s St Paul oratorio on 24 February. At the end of the performance a collection was taken for Avon and Somerset Search and Rescue. 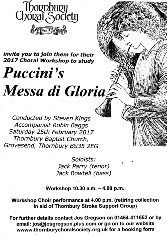 This was Puccini’s Messa Di Gloria on 25 February. 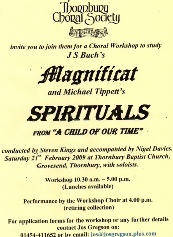 At the end of the performance a collection was taken for the Thornbury Stroke Support Group. 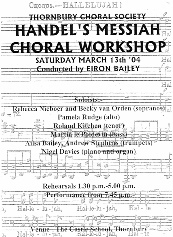 This was Haydn’s Creation on 20 February. At the end of the performance a collection was taken for the Bristol Pulmonary Fibrosis Support Group. 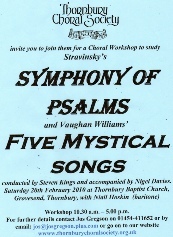 The 2015 Workshop took place on Saturday 21 February 2015 at Thornbury Baptist Church. 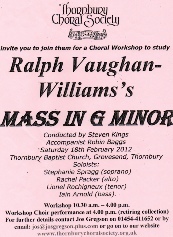 The Workshop studied the colourful and exciting Requiem by Giuseppi Verdi and was led by Steven Kings, Thornbury Choral Society's regular conductor, and accompanied by Robin Baggs, their regular accompanist. 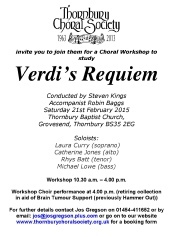 Thornbury based charity Hammer Out (for those suffering from brain tumours) was the Workshop Charity beneficiary. 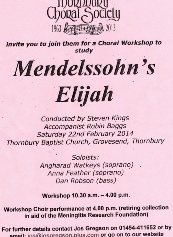 The 2014 workshop was on Saturday 22 February 2014 at Thornbury Baptist Church where the assembled singers studied Felix Mendelssohn's exciting oratorio Elijah under the tuition of the Society's regular conductor Steven Kings. 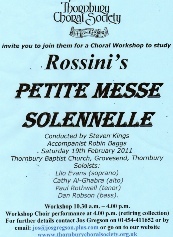 Accompaniment was by our regular accompanist Robin Baggs, recently returning safely from Kiev! 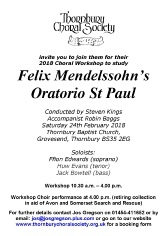 Elijah was rehearsed in the morning and afternoon from 10.30am with lunch and tea breaks and an open informal performance by the workshop choir was given at 4.00pm to which the public were invited. 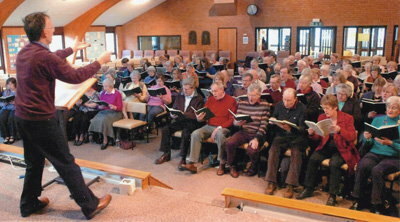 A retiring collection for the Meningitis Research Foundation raised £456.90. 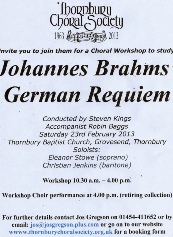 We were joined by soloists Angharad Watkeys (soprano), Anna Feather (soprano) and Dan Robson (bass).